For the last year or so, I've had a growing crush on dark powder rooms. Maybe it's because they're always small, so a dark dramatic color feels like a surprise. Or maybe it's because it's a very intentional design choice (nobody accidentally paints a bathroom dark blue), and so it feels special. No matter the case, small, dark, dramatic rooms (bathrooms, specifically) make me feel like I'm in a 1920s Gatsby-era environment and that makes me feel fancy (even if I'm in the bathroom). Dark bathrooms are the caterpillar's kimono, and I love them. Have a look! In the case of the Curbly House, this is the only room in the house with a bold color. Everything else is painted Sherwin-Williams Simple White SW 7021 (which is my favorite white). This one was easy to overlook because the room's purpose is mostly functional (hello, first floor bathroom! ), not aesthetic. I began my quest for the perfect deep, rich navy blue by perusing the Sherwin-Williams website. I was immediately drawn to their Pottery Barn palette because it's so classic and rich. I love the neutrals in this line, and I love the way the darker colors complement them. In fairness to the bathroom, this is a tragically pathetic 'before' shot. Bruno didn't even bother to remove the plastic bag and window cleaner before snapping the photo. Editor's note (Bruno): in fairness to me, I had a bunch of much better 'before shot' on a hard drive that crashed and burned last week, so this pathetic phone snap is all I had left! 1. Dark colors recede. Contrary to what you may think, painting a room with a dark color will actually make it appear larger, not smaller. 2. Use two coats to make sure you achieve full coverage. Dark paint is slightly less forgiving than its lighter-toned friends. You will need a minimum of two coats to ensure proper, complete coverage. Be sure to paint with plenty of light (natural or artificial - you'll want to be able to see what you're doing). 3. When using dark colors on a small space with low ceilings, paint the ceiling the same color as the walls. We didn't have to do this, but if your ceiling are on the low end, keeping the whole room cohesive will actually help make it look larger. 4. And lastly, painting in a small room like this is tricky, because you don't have much room to do the work. To give himself more room, Bruno removed the door from its hinges so that he wasn't having to work around it. What do you think about using a bold, dark color in a small space? Let us know what you think in the comments! This post is sponsored by Sherwin-Williams, but all opinions are mine alone. Brand partnerships keep Curbly running and pay for all the free content we create on the site. Thanks for supporting the brands that support Curbly. I love it! I have a rather large guest bathroom w/tub, and i am prob going to pain the walls this color. (Naval) im just concerned that because it has no window, it may be too dark... guess well find out! Love the paint color. I agree the dark paint color makes the bathroom look larger. @S - thanks! We live in Minnesota, so it's very cold and dark here in the winter, and I think it still works well. I agree, though: it might not be a good idea in a bathroom with no window at all. hmm, not sure how this would be in a bathroom that has no window. also, living in a very cold, dark and rainy climate in the winter -- this could be depressing. looks classy in your picture, though. @sue - thanks for your feedback ... and I'm glad you like your small bathrooms light. We think this one turned out great, so I guess we'll just have to disagree on that point. No! This bathroom should have stayed a light color. That dark blue is way too dark for such a small room. 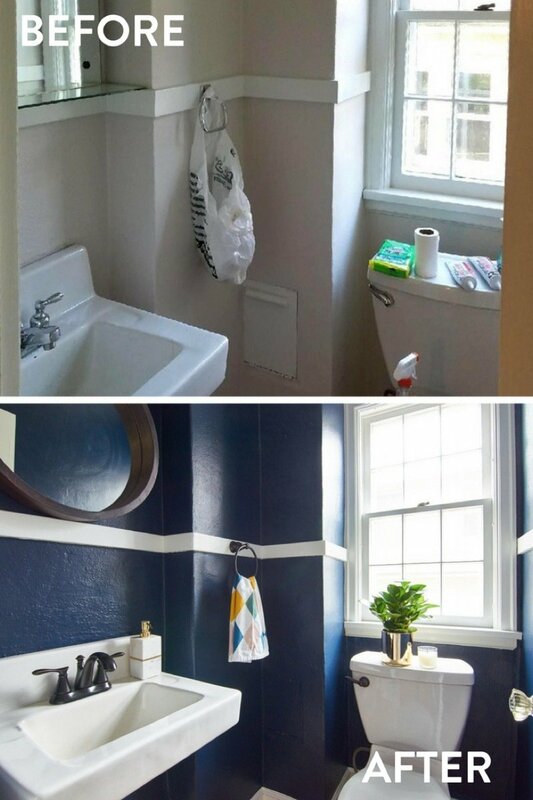 I have two very small bathrooms in my house and made sure to paint them very light colors. They are small enough on their own without painting them some dark color and making me feel claustrophobic in them. Plus, the dark color just swallows all the light. Not a good choice! @michelle - good point. The space is so tiny, though, that there's no good way to get a shot of the room *and* the ceiling together (so it would just be a shot of a ceiling). Sorry! In the Tips you mention painting the ceiling but there are not any photos showing the ceiling. I know you said you didn't do this. A photo showing what it looks like without a painted ceiling would be helpful. That blue makes the floor POP! I didn't notice the floor at all in the before shot--totally washed away in dreariness. But against the contrasting deep blue and bright white, that floor shines!